Delivering great customer experiences includes streamlining your business processes to reduce customer effort throughout a call. Poorly designed and outdated Interactive Voice Response (IVR) increases customer effort, destroys customer satisfaction and results in higher cost to serve. 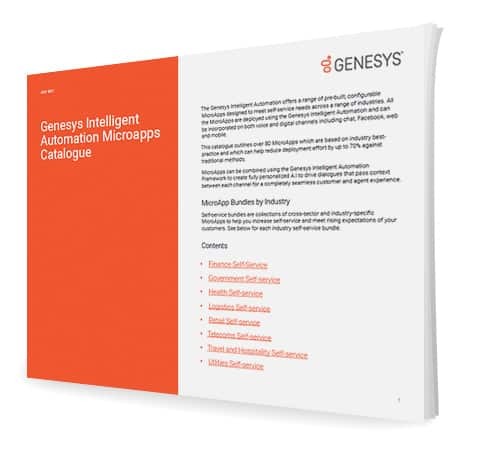 The Genesys Intelligent Automation provides a complete environment to design, configure, test, deploy and manage IVR applications on Genesys Voice Platform (GVP). This is done through an intuitive, web-based interface designed specifically for non-technical users called the Genesys IVR Control Center. You get out of-the-box capability that delivers a cost-effective customer service approach along with a rapid return on investment. Download this executive brief to learn how the Genesys Intelligent Automation integrates with Genesys Voice Platform.